The client: Steeped in a history of traditional liquid printing, Reel Appeal now also uses the most advanced digital printing systems to meet the needs of clients. From bespoke hand made brands to millions of labels for market dominators, this fantastic spectrum means that precision and style is never compromised. They produce the labels we see and use every day. The challenge: To place a new control panel within an existing machine that would increase levels of production and accuracy – to be precise, a system that measures within 1 micron, which is a thousandth of a millimetre! Running at 40 metres of reel per minute, any discrepancy would accumulate, hence the stringent requirement on accuracy. We all know first impressions count, and never more so than in the world of retail. In that split second, our choices tend to be based on aesthetic and the confidence inspired by perfection. 2M regularly work with printing clients on everything from books to labels, bringing their experience to the digital printing process. A great deal of careful fine tuning comes into play at the factory level. A simple second off beat, or millimeter off mark, can be enough to turn a customer away. The balancing act was to work with the existing high speed press which whizzed through 40 metres of reel per minute and introduce and maintain this incredible level of accuracy, there’s no room for drips or smudges here. The client also wanted to improve efficiency and meet an increasing number of orders. How do you help a client meet an increasing number of orders without recommending costly machine changes? Where this beautiful green machine made in the 70s was concerned, whenever a different sized leaflet was going into print, up to 16 pegs required manual adjustment along its chain. Furthermore, each time a new speed setting was required, multiple gears also required manual changing. Freeing the operators from these time consuming changeovers would not only make their jobs easier, but also allow the client to meet increased orders. 2M introduced print mark registration to the machine. This is where a rotary punch is synchronized with the printed web. In other words, the perforations of each booklet made by the rotary punch are now always exactly in line with the printed text they encircle. 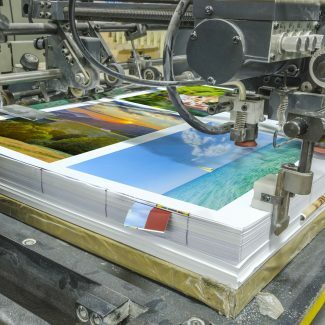 The existing machine required a lot of manual operation when changing between print jobs, and 2M identified this as a key area for improvement to speed up production capabilities. A common problem with rotary systems is that mechanical gearing misses its positioning by fractions of a millimetre per turn. Therefore within a couple of hours the cumulative affect of this error means the print may be off mark by whole millimetres. As this leads to imperfect print quality, once again a manual repositioning is required at specific intervals. 2Ms servo system alleviated this shortcoming by constantly correcting the rotary punch position on the go, so there’s never any error in positioning, not even a miniscule one. 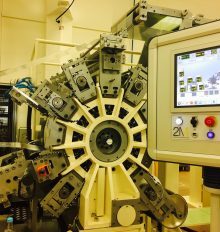 2M brought their experience in high speed print registration to a mechanical rotary punch system. This allows the client to meet the increased demand for their product by saving the time it takes to make mechanical changes on the line between products. Now operators switch between settings within a matter of seconds via the touch screen. In addition, positioning is now accurate to less than half a millimetre at all times.